SonicWave Component Video Plus S/PDIF digital audio combination cables are meticulously crafted to ensure full, accurate and interference-free delivery of critical digital audio and component video signals. Silver-plated oxygen-free copper conductors and nitrogen-foamed PE dielectric combine with Cu Shielding Technology™ and a 24K gold-plated connector to provide a lifetime of uncompromised performance. The OFC-braided shields are combined with a 100% Mylar® foil wrap to ensure immunity to environmentally-induced noise. These precision cables are guaranteed to allow the full resolution of high-definition video and jitter-free digital audio data to be delivered to the downstream component. 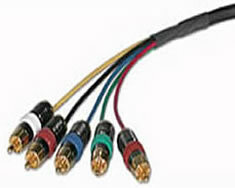 Precision construction techniques maintain characteristic 75-ohm impedance in the SPDIF digital and component video conductors for maximum stability and fidelity. 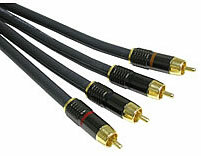 SonicWave component video/SPDIF coaxial digital combination cables, you will see and hear all the detail your system can deliver.